Have you been feeling stressed, sluggish, overweight or feel like you need a boost in your overall mood? You may be deficient in B vitamins; nutrients we normally receive through our diet that greatly affect our mind, mood and metabolism. If you feel you could benefit from a B-Complex shot, then read more to learn if an injection is right for you. What is in a B-Complex Shot? One dose of a B-Complex shot contains the eight essential B vitamins our bodies need for proper functioning. The vitamins B12 and B6 along with B1 (Thiamine ), B2 (Riboflavin), B3 (Niacin ), B5 (Pantothenic Acid), B7 (Biotin) and B9 (Folate) all work together to improve our mood and health. You may have tried everything to lose weight, but sometimes diet and exercise are just not enough. Vitamins B5, B6 and B12 work together to help the body break down to metabolize fats and carbohydrates for energy. Vitamin B6 works extra hard metabolizing fats, carbohydrates and proteins which can help speed up your metabolism and burn more calories. Do you feel like you have a case of the “winter blues” or something more? Vitamins B9 and B12 are known for their benefits in fighting depression and improving one’s mood. B12 plays a part in regulating our nervous system and help prevent the development of brain ailments such as stress, depression, various brain diseases and memory loss. A dose of a B-Complex shot can give you that “pick me up” you’ve been needing. Vitamin B12 is known as a natural energy booster because it helps convert carbohydrates into glucose which in turn produces natural energy. This helps us feel less fatigue and lethargic. Vitamins B5 and B7 will help reduce the signs of aging by replenishing its glow and elasticity. B7 alone will greatly improve the look of your hair, nails and skin. Your skin will thank you after a dose of B-Complex. We would all love to feel less stress and thanks to vitamins B6 and B1, you can. These “anti-stress” vitamins work together to help clear your mind. These essential nutrients ease stress and anxiety and may help protect your body’s immune system. Packed with antioxidants, Vitamin B2 fights the free radicals that can bring on harmful diseases such as heart disease. B2 also helps red blood cells carry oxygen through the body more efficiently. Vitamin B3 is essential in helping improve your cholesterol levels. It boosts the high-density lipoprotein cholesterol (the good cholesterol) which triggers the levels of bad cholesterol to lower. Improve your overall health with a B-Complex shot. You’ll be on your way to feeling and looking better in just one dose! 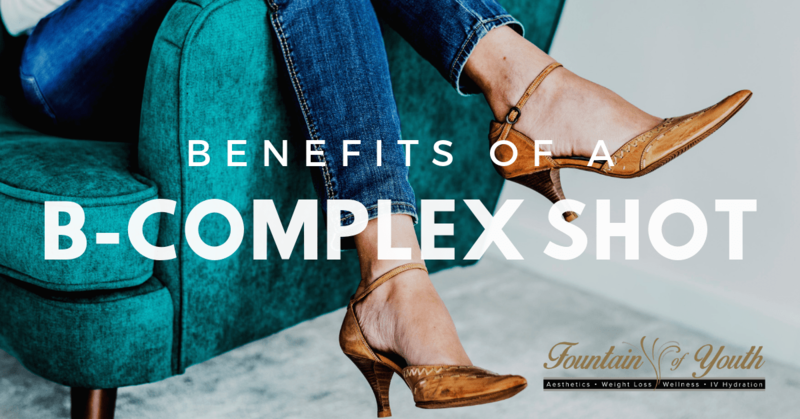 Do you want to feel and see the benefits of a B-Complex shot? Then visit us at 6729 Spanish Fort Blvd. Ste BC in Spanish Fort, Alabama, call us at (251) 525-8446.